SAM Tomkins is an injury doubt for England’s Test match against France at Leigh on Saturday. England head coach Steve McNamara has revealed the full-back is still troubled by the knee problem that sidelined him during New Zealand Warriors’ season and eventually brought his NRL career to a premature end. Tomkins, who cut short his stint in Auckland to rejoin home-town club Wigan for the 2016 season, trained on his own on Tuesday at England’s new base at the FA’s training camp at Burton upon Trent in Staffordshire. It is almost two months since Tomkins’ last match but McNamara insists he will not rush the player back, although remains confident he will be fit for the start of the three-match Test series against New Zealand, which gets under in Hull on Sunday week. “Sam has had an issue from the NRL season,” McNamara said in his first press conference since returning from his job as assistant coach of Sydney Roosters 11 days ago. “If Sam’s fit he will be considered, if he’s not we’ll get him right for the week after. “He’s a strong chance of playing this week. We’ll probably know a little bit more after another session tomorrow. 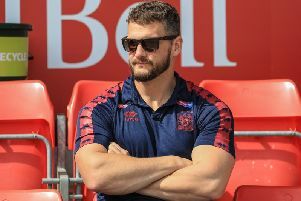 England captain Sean O’Loughlin also sat out Tuesday’s contact session at the 330-acre training park but, like Tomkins, has not yet been ruled out of Saturday’s game at Leigh Sports Village. “We’ve a couple of players we always manage through the week in terms of workload and people at different stages of their careers,” McNamara said..
“Our performance staff are very good, they’re very diligent, and managing the players is a really important part of our programme. “We’ve Monday, Tuesday and Wednesday field sessions this week and Sean trained really well yesterday. It was deemed best for him to do alternative training today, which was about contact and real physicality. “It wasn’t about shapes of running defensive patterns, so it was an opportunity for Sean to recover from yesterday’s session. “Obviously with Sam, we’re protective of his knee in terms of getting done what he needs to get done to give him the best chance of playing this weekend. “At the minute, he’s doing what’s right for his body. “It’s important when he’s fit he’s fully fit. That’s most important for me. When you’ve got a fully-fit Sam Tomkins, you’ve got a pretty special player on your hands. McNamara will announce his 19-man squad for the French game on Wednesday and says the nine Grand Finalists from Leeds and Wigan will be available. The coach insists the game against Richard Agar’s France is no warm-up for the clashes with the Kiwis, who are now the number one world-ranked team, but a full-blown Test match and he is expecting a tough game. “They’re always tough challenges against the French,” McNamara said. “We’ve generally come out on the right side of them and we aim to do that this time around. “Right from the start, we’ve said we’ve got four Test matches this year. We don’t get enough international caps as a team. The way the game is set up now, it’s very difficult to gain a massive amount of caps.